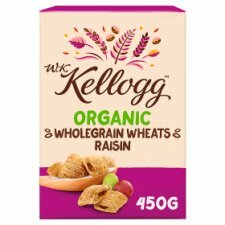 No Added Sugar Organic Shredded Wholewheat with a Raisin Centre. Enjoy as part of a balanced diet and active lifestyle. Contains ≥ 15% RI magnesium. Magnesium contributes to the reduction of tiredness and fatigue. We pride ourselves on bringing you our very best in every bowl, that's why we don't make cereal for anyone else. Don't be shy pick me up!